If you’ve read about or watched much footage of Revolver, you’ll probably have heard of the ‘chess’ offense they run, featuring different players in specifically defined roles. But what are the fundamental patterns in use? And how does each one maximize the effectiveness of a team that loves to play 1-on-1? It can be difficult at times to see the reasons that a team like Revolver is so effective year after year, even with lots of roster changes. Their well-known IHD principles — Intensity, Humility, Discipline — are clearly a factor. But so is a deep understanding of the game, knowing precisely which situations to exploit to their advantage, and how to leave opposing defenses scratching their heads. We will start by examining some offensive patterns that Revolver keep falling back on when they need to; well-drilled and well-known by the squad, they allow Revolver to use advantageous situations they find themselves in. This adaptability gives Revolver a killer edge at times but can also be a potential pitfall. Revolver again enters Nationals as the #1 seed. Will they take home another gold medal? It might be popular at summer league, but handlers busting deep isn’t seen too often at the elite level. Revolver is bringing back an old favorite. It’s important also to highlight cuts that aren’t hit; here, Marcy busts deep after throwing a short gainer, but draws a deep poach. Davis takes advantage to get the disc under. Many handler defenders simply aren’t good at guarding deep cuts, and certainly tend to be positioned to prevent the “handler” from getting the disc again in the back field. Cutting deep generally draws switches too; if you’re sharp at reacting to them, you’ll be able to hit the poached player for a gain, something that Revolver excel at. It also helps that, typically, a marker has their back to the field, while a thrower is facing the endzone. This means that when a thrower immediately strikes deep after releasing the disc, they are almost certain to get a good separation, taking advantage of the fact that the player guarding them started in a grounded position facing the wrong way. It is also worth noting that we see the same few players making these moves (generally, cutters after catching in cuts), something their opponents need to be clued into come Nationals. Can Revolver break marks? Sure. But do they always need to break a mark in order to get the disc to the break side of the field? By carefully timing repeated cuts towards the break side, Revolver seem to ensure that they are able to effectively neutralize a marker. If the marker commits to stopping the around threat, then a second cutter moving towards the inside channel is practically impossible to cover. Note that cuts start on the open side and move across to the break side. This gives the thrower the biggest possible amount of space to throw into. This example from US Open shows two Revolver cuts to the break side; Stubbs gets to look at the around and then the inside options to different cutters. Having taken neither option, he flips the disc to Schlachet. At this point, the two Buzz defenders are poaching way off Davis & Grant Lindsley, and they immediately clear to the far side of the field. This movement draws the poaches away, clearing space for Higgins. This is a classic Windmill pattern used to drag players out of space in a horizontal stack and set up a more typical side stack look, and a really good combination of cuts to run if the initial cut is stopped. If a cut from the open side to the break side isn’t hit early, then the thrower can step out to break around the mark. If the marker is committed to preventing that pass, then there’s simply no way they can stop an inside throw to another cut closely following behind. By attacking this spot on the field at the right time, Revolver ensure that the marker just can’t win. “Ok, so we’re getting beaten to the break side. Maybe we should just reposition to prevent that?” The problem: Revolver is perfectly good at hitting isolated players on the open side too. In fact, when you’re constantly cutting deep, it’s likely that your opponent will look to switch often. Revolver are masters of picking up on these opportunities to hit the poached player. Here, Marcy busts deep after throwing a short gainer, but draws a deep poach. Davis takes advantage to get the disc under. There are dozens of examples of this, but I particularly like the speed with which Revolver seem able to identify where on the field an isolated cutter is most dangerous. In both of these examples, the thrower quickly identifies a spot in the endzone that can’t be defended, taking advantage of momentary opportunities. Well, why not take on a short throw to an isolated cutter when you can? Keep the disc moving, change the angle of attack, and give your players lots of experience hitting the poached player. 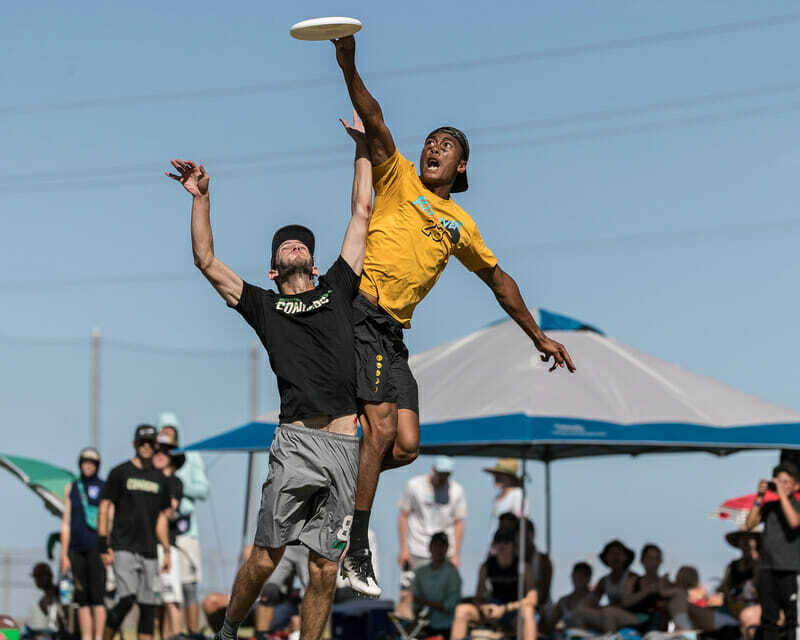 When they get the opportunity to throw long, Revolver loves to put the disc away from the defender. It sounds obvious, but again it’s worth pointing out because it makes every deep cut more effective, and therefore defenders must respect each and every one. This first example is quite a bad throw in many respects–the receiver is too deep, the throw too short–but because it’s thrown to the shoulder opposite from the defender, the receiver can use his body to shield the disc and enable him to make the catch. In this fast break example, Eli Kerns puts the disc out to the side away from Nathan White’s defender. As the Dig defender drops behind White in an effort to get to the disc, White is able to then reposition himself, keeping his body between the disc and defender for an easy goal. What happens when you bring it all together? Handlers attacking deep, a deep throw to the undefended side, and a quick bit of handler movement to score. Putting the disc away from the defender increases the error margins, as even a relatively poor throw put into the right space gives the receiver the chance to box out. Their athleticism is undeniable and they are far more willing to punt the disc all the way to the endzone whenever one of their athletes gets even a small amount of separation than Revolver has typically in the past. Conclusions: Revolver know how to carefully time their cuts and use defender’s positioning to their advantage, effectively turning a game of 7-on-7 into a game of 2-on-2 as and when it suits them. Revolver’s favorite way to play is to put their superior athletes in a cutting position and let them cut with as much space as possible. This isolation offense is just as effective now as it was in 2014, and we still see lots of examples of this. All of the information above about Revolver cutting deep validates in the minds of the defense as to how dangerous Revolver are going long. As a result, the vast majority of the time, Revolver cutters instead end up taking easy unders. Starting from a horizontal stack, Revolver begin a series of deep cuts, each starting relatively shallow to the disc, going away, then back under for big gains. If you want to read more about how these cuts work, read the detailed breakdown of their isolation offense. That’s not to say that things always go smoothly; high reward throws like these come with elevated risk, and the slightest misthrow can result in trouble. This example shows Schlachet going long from a handler spot, but the throw hangs a little too long, resulting in a foul on the receiver. One area of weakness for Revolver is their O-line’s ability to get the disc back after the turn. In their game vs Dig, every time they turned the disc, they got broken. So if they are going to take on these high risk throws, there’s a potential weakness for their opponent to exploit. Watch Marcy in the following clip. While the handlers work to generate power position, Marcy attempts to go deep off each and every handler move, finally getting free and scoring on the third attempt. This is a clear example of a single player being given license to do what they want in the offense; after all, Marcy brought the disc into play on the brick and ends up going deep. Few players operate like this, making it difficult to match up against. It wasn’t always smooth sailing for Revolver’s offense. Their match up with Dig was a high quality game, and Dig’s handler defense caused Revolver some trouble. In the first example, a simple lane poach combined with a shifting mark gets Revolver to a high stall before they find an open cutter. Of course, Revolver are comfortable passing the disc around and biding their time. But perhaps having an offense loosely defined around roles can create confusion; note the confusion in the cutters in the next clip, with three moving simultaneously off the first catch, then some indecisive and ineffective movement from Stubbs. Marcy’s positioning also allows a defender to poach in the lane. The lack of cuts in the next clip seems to imply that this should be a handler led point, but Dig’s loose defense around the disc makes it tough for Revolver to gain yards. Note the indecision again with the cutters; who is meant to help when things aren’t working? No one seems to be sure. Certainly, some of the cutters look uncertain about what they are trying to do, resulting in a turnover as the usually perfect Joye throws to…nobody. Was he expecting a cut into that space? Perhaps he misread a cut? Or an execution error perhaps? Whatever it was, the normally crisp, decisive Revolver showed that if they can be knocked out of stride, they are as vulnerable as any team. They struggled with similar issues in the final of this same tournament, the Pro Championships, where they lost soundly to New York PoNY, 15-12. One unspoken rule about using an isolation offense is this: the thrower really needs to hit the isolated cutter. Watch what happens when the movement stalls; there’s no secondary cut for Stubbs to hit, Marcy is forced to make three big cuts just to clear out, and the handlers clog around the disc. It’s left to Joye’s trusty shimmy to relieve the pressure. Situation: Revolver receiver catches the disc just short of the endzone, with his defender laying out and a single cutter in front of him isolated in the endzone. Surely it’s a dream situation. Yet just a few passes later, we see a simple turn on a reset as the handlers miscommunicate. Why? A combination of factors: Davis clears into the potential scoring space of his isolated teammate, preventing the easy goal. Poor reset cutting (and good defense) prevented Schlachet getting the disc. When the disc gets to the other sideline, more indecisive cutting (and good defense) again prevent Schlachet from getting open. Finally, Greg Cohen fakes out his own reset, resulting in a turfed pass. Yes, Dig did a great job here, but make no mistake: Revolver caused this themselves. Revolver is an extremely highly skilled and adaptable team, leaning on a few patterns that they can use repeatedly to their advantage. Notably, they typically use a defender’s positioning against them, neutralizing any athleticism deficit that might exist. Revolver can also switch between using their cutters or handlers to dominate a point, and they seem to be able to quickly take advantage of defensive positioning errors. Yet this very adaptability can result in confusion, with players unsure of what they are meant to be doing, cutting each other off, and resulting in simple miscommunication turnovers. Typically, though, it allows them to gain yards easily and attack areas of the field that can’t be guarded. And with weeks of additional practice since the games shown in the clips above (from early and mid-September), expect their cohesion to be even better at Nationals. With so many dangerously athletic cutters and dynamic handlers, Revolver remains the team to beat in this year’s National Championships. By disrupting their patterns, Revolver’s opponents might be able to cause enough confusion to generate rare errors and have a chance of toppling the champions. Comments on "Isos, Hucks, Dynamism: How Revolver Runs Its Offense"